I admit, I’m actually not the hugest of potato lovers, (unless you count Crispy Baked French Fries… do fries even count as potatoes? 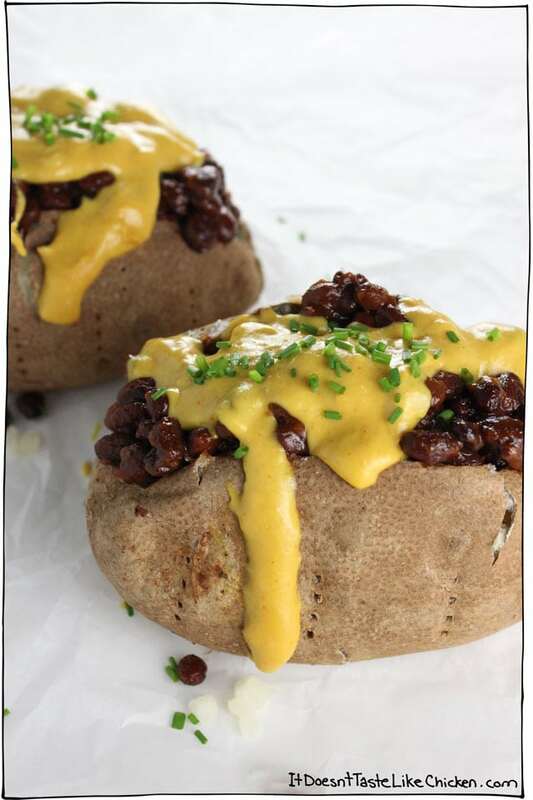 ), but even as a not potato crazed person, I’m OBSESSED with this Vegan Loaded Baked Potato. So filling, easy to make, layers of deliciousness… you tried to woo me, potato, and it totally worked. The potatoes have a lightly crisp skin on the outside and are soft and fluffy in the middle. The beans are simmered in my favourite BBQ sauce, making them totally flavour packed. Last, it’s topped with chopped chives because →pretty← and it’s now ready for digging in, and dig in I shall. Yeah, I think you understand the deep connection I’m having with this vegan loaded baked potato right now. These potatoes make a great side, but they are so flavour-packed and hearty that I always just serve them as the main. I mean really, look at them, they deserve to be the main. Any leftovers (ha!) can be stored in the fridge and reheated the next day, making them a great take to work lunch. 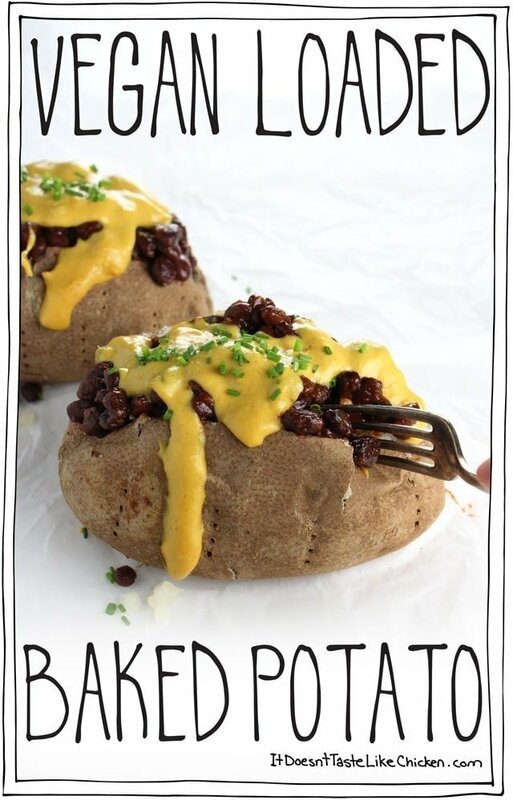 To make Vegan Loaded Baked Potato, you will need to start by baking your potato (obvi). 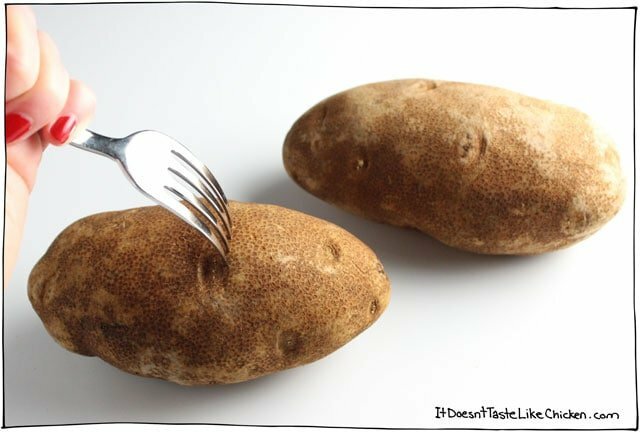 Pierce the potatoes all over with a fork so steam can escape. Optionally, you can lightly rub the potatoes with a bit of olive oil over the skin. Place the potatoes directly on the rack in the oven, with a tray or piece of foil beneath to catch any drippings. Bake for 1 to 1 1/2 hours (depending on the size of your potatoes). Test doneness by piercing the potato with a knife, it should be soft all the way through. When baked, cut a slit down the middle of the potato, (careful, it’s hot! ), then using a towel or oven mitts, push the ends towards eachother and the potato will pop open nicely. Fluff the insides with a fork. In the meantime prepare the Melty Stretchy Gooey Vegan Nacho Cheese according to directions. 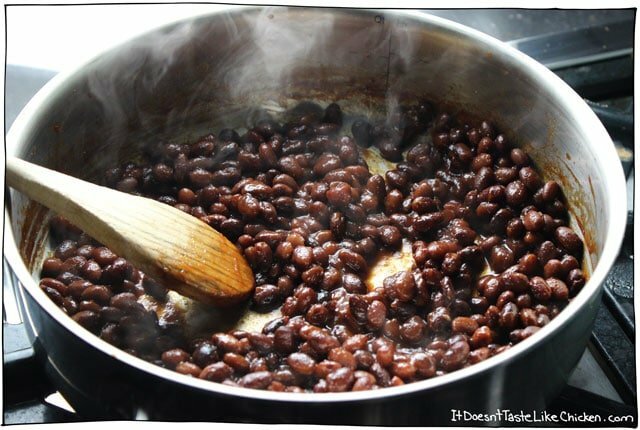 The prepare the beans by adding them to a saucepan along with the BBQ sauce. Bring to a simmer and cook for about 5 minutes until the sauce thickens and the beans are heated through. 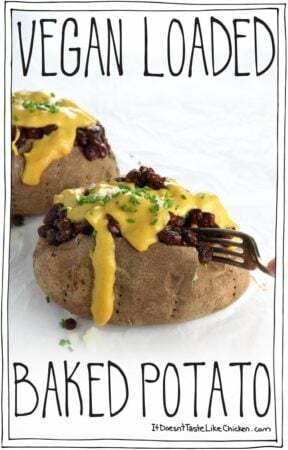 When everything is cooked and ready, assemble by dividing the BBQ beans among the potatoes, topping with the melty nacho cheese, and finally adding a sprinkle of chives. 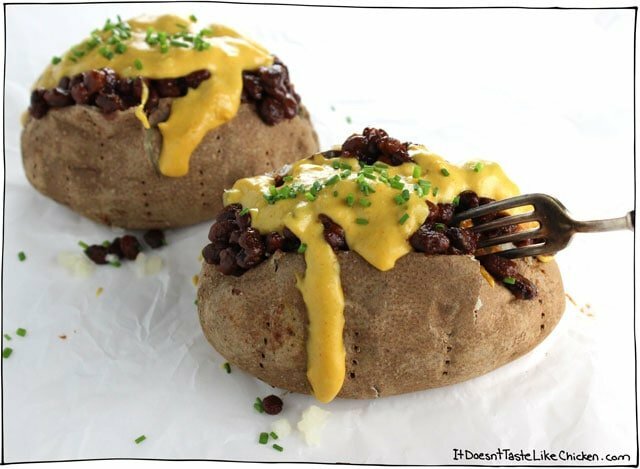 This Vegan Loaded Baked Potato has lLmiddle, layered with BBQ beans, and easy to prepare dairy free nacho cheese. So delicious! Pierce the potatoes all over with a fork so steam can escape. Optionally, you can lightly rub the potatoes with a bit of olive oil over the skin. Place the potatoes directly on the rack in the oven, with a tray or piece of foil beneath to catch any drippings. Bake for 1 to 1 1/2 hours (depending on the size of your potatoes). 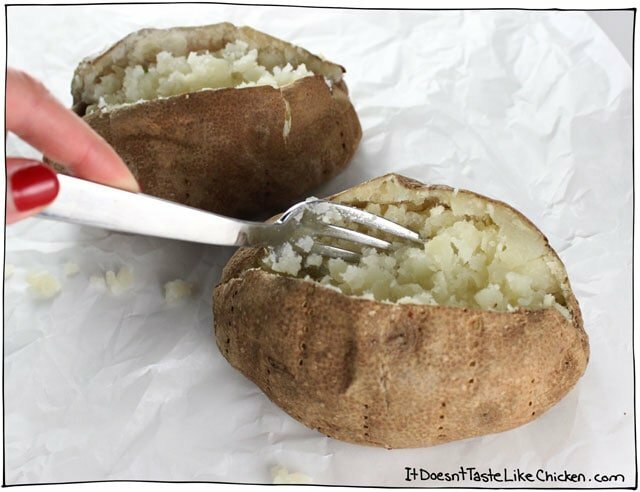 Test doneness by piercing the potato with a knife, it should be soft all the way through. Cut a slit down the middle of the potato, (careful, it's hot! ), then using a towel or oven mitts, push the ends towards each other and the potato will pop open nicely. Fluff the insides with a fork. 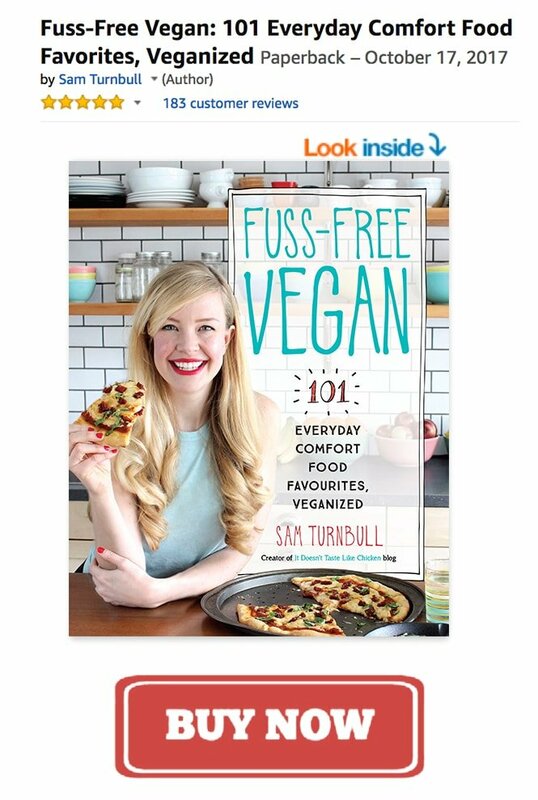 In the meantime, prepare the Melty Stretchy Gooey Vegan Nacho Cheese according to directions. Then prepare the beans by adding them to a saucepan along with the BBQ sauce. Bring to a simmer and cook for about 5 minutes until the sauce thickens and the beans are heated through. I made this sauce and it was was runny at first and then got really thick and you can barely put it on anything it’s so thick. Is there any way to fix it? I’m guessing you are referring to the nacho cheese? If so, the cheese will be very thin at first and as you cook it the tapioca starch will thicken it to make a gooey stretchy cheese. If yours became to firm you may have just cooked it a little too long, but it’s not a problem, you can just whisk in more water until desired consistency is reached. Enjoy! Son of gun! I have to make this. So simple, yet so tasty. Haha I hope you enjoy it when you get to it! Simmering beans in BBQ sauce?!? PURE GENIUS! I’ll def be trying out this recipe ASAP. Haha, oh why thank you! It’s one of my favourite tricks to take boring beans to awesome in 5 minutes 🙂 I hope you love the recipe! I heart carbs, too. I just don’t know how to put a heart in. Tee hee. Stubbs has some vegan varieties of barbecue sauce, and they are tasty. The flavors with honey state that fact very clearly in the name. Steer clear of those, and you should be fine. I actually find a decent amount of vegan BBQ sauces in the grocery store. They don’t say it on the label, but the ingredients check out. Anchovies and honey are the most common non-vegan ingredients I find. The one I currently have in my fridge is Bulls Eye Blazin’ Chipotle. It’s spicy and yummy!